Filed to: What would molydeux?Filed to: What would molydeux? "What Would Molydeux? ", the cheekily titled game jam dedicated to the weird and occasionally brilliant ideas of the twitter persona Peter Molydeux, continues to grow. What started as a goof on twitter quickly became a San Francisco event, which expanded to New York and the UK and possibly even convinced the real Peter Molyneux to attend. 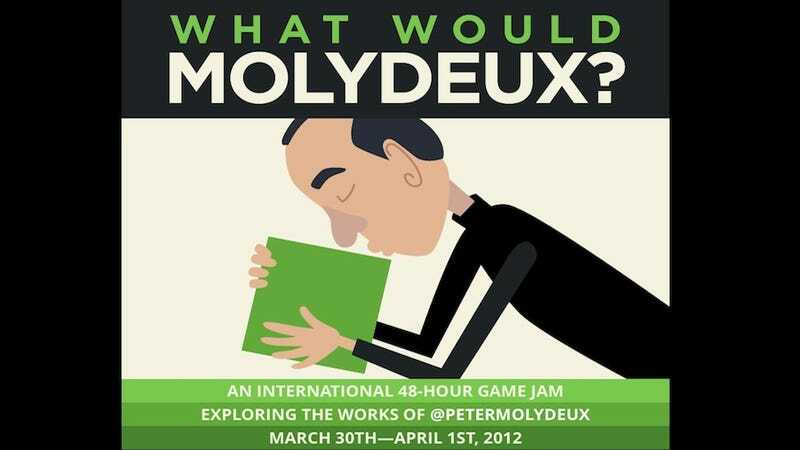 The jam, hashtagged #molyjam2012 on twitter, has expanded from San Francisco, New York, and the UK to include four new locations: Boston, Seattle, Montreal, and Melbourne. (Update: Make that five! Los Angeles has been added since I posted this.) There will be two UK locations, one in Brighton and one in London. All jams will be happening for two days over the weekend of March 31st to April 1st. Molydeux himself has made a list of the ideas he thinks would make for the best game, and yeah, all of these are pretty fantastic. I hope someone grabs that great one about the survival horror game where you can only see enemies in mirrors. If you're a game developer or creative type in one of those locations, hit up the official page to sign up.